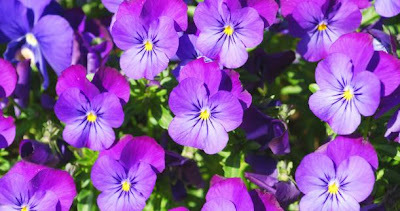 Hello friends, today is leap year and my daughter Gloria's sixteenth birthday, so in honor of that and because February's flower is the Violet which is one of my favorite flowers. They and dandelions take me back to being a little girl making chains and crowns out of them (sigh). Did you know that there are three kinds of Violet's? Well there are and I'm going to tell you about each one cause I couldn't pick which one I liked best! Sweet violet, or viola ordorata, is a low-growing perennial, perfect for the rock garden and easy to care for. They are members of the pansy and viola family, like their early spring-blooming cousins, they are a welcome harbinger of spring. They are often grown in containers on sunny windowsills. You can grow these from seeds start about six to eight weeks before the last frost. Keep them in the warmest place in your home, seeds won't germinate if it cold. Plant outside when you know that the frost is over and though the seed packet will say plant in direct sun, if it gets really hot where you live, plant in partial shade and put some good fertilizer with them. 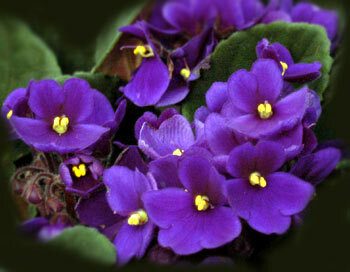 African violets are propagated easily by leaf cuttings. Select a healthy and firm leaf from the middle of the plant and snap or cut it off at the stem leaving the petiole (leaf stem) intact. Trim the petiole to about 1 – 1 ½ inches in length. A combination of half vermiculite/ half sand, or half vermiculite/half potting mix makes an ideal propagation medium. Insert the petiole into the medium by pushing it into a hole made with a pencil or similar tool . Roots normally form at the petiole base in three to four weeks, and leaves of new plants appear three to four weeks after roots form. I recommend repotting your violets every six months or so. Though violets like to be slightly root bound, the roots can become so thick at the edges of the pot that water can no longer get through to the center of the root ball. Though the reservoir may be full, your violet may actually become too dry to feed itself. The heart shaped leaves often with scalloped or slightly serrated edges are dark green, smooth or sometimes downy underneath, and grow in a rosette at the base of the plant. Roots are creeping and send out runners. Depending on soil and light the flowers may be from deep purple or blue to pinkish or even yellow whitish. All have 5 petals, which may have a yellow (fur) or beard on the inside of two of the petals, blooming from March to June. And friends stop trying to kill them, it's almost impossible and your wasting your money and putting poison in our earth.